Seamus Parsons was a long lost cousin of William Parsons, 3rd Earl of Rosse. Now, William Parsons was famous for his ‘Great’ 72-inch reflecting telescope known as the ‘Leviathan of Parsonstown’, which he used to study the then mysterious objects known as nebulae. 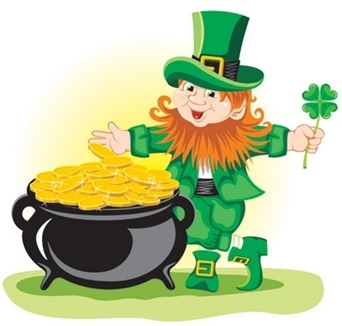 Seamus on the other hand, although a somewhat eccentric but gifted scientist, was renowned in Ireland for having cheated a Leprechaun out of his ‘pot of gold’ at the end of the rainbow. In punishment for this he had been cursed in a rather unusual manner. 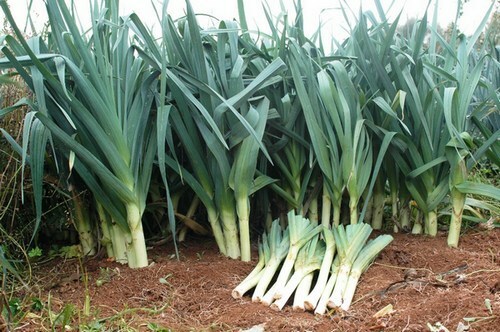 Seamus was the owner of a rectangular field in which he grew Leeks. His Leeks had been the biggest and finest in all the ‘Emerald Isle’. They were his pride and joy, and the ‘love of his life’, that was until Freckles O’Gold the Leprechaun he had tricked - gained his revenge. Now Freckles was the cleverest of all his kind, and through the magical skills that all Leprechauns possessed - placed an invisible dark cloud above Seamus Parsons’ field of Leeks, which meant that every day, no matter what the weather was like elsewhere, his prize vegetables were drenched in a downpour of rain far greater than that which even Ireland was accustomed to! They were ruined, despite their owner’s best efforts. Now the gardeners among you will cry - Leeks need a lot of rain, that’s why Ireland is good for growing them! But, you forget Freckles O’Gold - he had added some leek killer to the rain. What could Seamus Parsons do? He pleaded with Freckles – how can the curse be lifted? Freckles being not entirely heartless said that if Seamus could draw an accurate picture in 65,536 shades of grey of the invisible rain cloud, he would remove the curse on his Leeks. Now Seamus being also a clever man and a scientist too, after a considerable amount thought, came up with an ingenious solution to what at first sight seemed an impossible situation – How can you find the shape and greyscale of something you cannot see or touch? He used the only thing he had by the bucket load – rain. One morning he went out to the local hardware store and bought all the buckets in Ireland nearly eleven million of them or more precisely some 10,709,376, as that was all he could get. He then arranged them in rows and columns on his Leek field – 4008 rows and 2672 columns. But before he did this he built a novel mechanism which could tip the contents of each bucket into a very special measuring jug he called an Analogue to Digital Converter (ADC), which had gradations from 0 to 65,536. The measuring jug was then put on a steam driven railway system so that it could move from bucket to bucket in sequence around the field. In this way he could determine how much rain fell in a particular square cell of the field in a particular time. The buckets I should have mentioned were square, it was Ireland after all! He also rigged up a mechanical shutter in the form of a sheet of canvas which could cover very quickly the entire field after a predefined exposure time to the rain. He then made use of a few thousand clever local pixies to do the measuring and convert the level of rainwater in each bucket into a number from 0 which meant no rain fell in a bucket to 65,536 for a full bucket. As Seamus was a little deaf he referred to his little helpers as pixels, a name he also used for the each of the 10,709,376 small areas of his Leek field. Not wishing to complicate matters he for some unknown reason called the railway system he had built a Pixel Multiplexer (PM). He was now ready for the rain; and so was his new Charge Coupled Device, the name he had given to his system on the grounds that he was in charge of a device which was coupled to other things – all perfectly logical! When the next rain came the buckets collected the water and after a five minute exposure he got his pixies to pull the shutter over his leek field. The pixels were measured by the ADC with the aid of the PM and the army of pixie computers made a note of the numbers for each of the 10,709,376 pixels. The head pixie known as Willard O’Boyle and his assistant George O’Smith processed the readings into a pixel image. The value 0 was denoted as Black and 65,356 was White, and the other values as in between shades of grey. Seamus Parsons now had his first rough image of the dark cloud he could not see, and because it was so far away it been invisible to all but Freckles O’Gold. Triumphantly Seamus then went to see Freckles O’Gold, who when he saw the picture he was furious. How could an ignorant Irish Leek farmer beat the Einstein of the Leprechauns? Yes, Seamus was right the dark cloud above his Leeks was the head of a black horse owned by none other Freckles’ great friend the Leprechaun known as Grim O’Reaper. With the revelation of the truth Freckles O’Gold jumped onto the top of a nearby rainbow and buried his head in his brand new pot of gold at its end – muttering words not meant for the ears of a pixie let alone a child. So forgot all you have read that the dark cloud known as the Horsehead Nebula was first imaged by William Henry Pickering on the 6th of February 1888 and discovered by Williamina Paton Stevens Fleming. It is not the case. Our black steed was in fact first captured by Seamus Parsons in an Irish Leek Field and discovered by Freckles O’Gold on a trip across a rainbow to the distant land his forefathers called O’Rion. Furthermore the CCD was not invented by Willard Sterling Boyle and George Elwood Smith in 1969, but by Seamus Parsons many years before in the land of Leeks and Leprechauns we call Ireland. 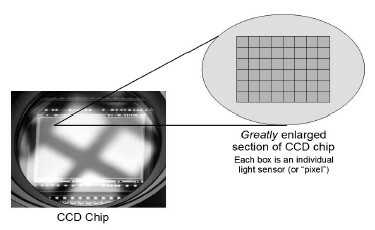 It is also remarkable that Seamus’s CCD was very similar in specification to one developed by the Santa Barbara Imaging Group which they called the STL 11000 series. I wonder where they got the idea from. 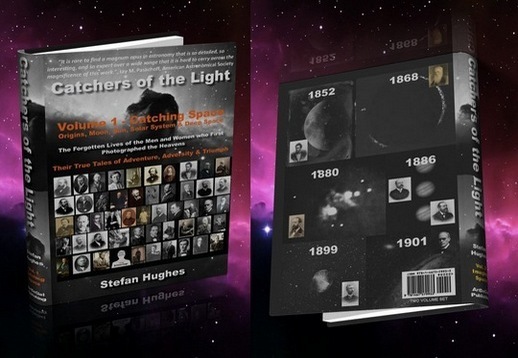 The above is an extract from the Book the 'Catchers of the Light' which tells of the 'Forgotten Lives of the Men and Women (and Leprechauns) Who First Photographed the Heavens'. 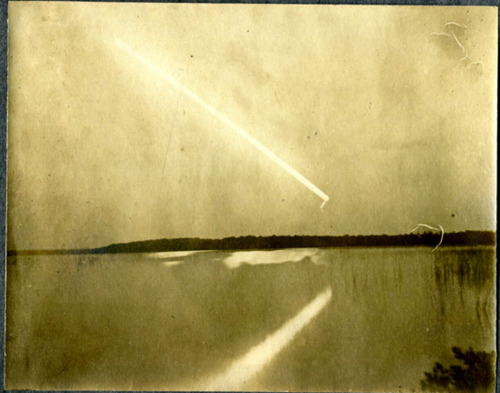 A few weeks ago a fellow photographic historian and blogger asked for help with the identification of two old photographs of comets, which his daughter had found in a scrap book in an antique shop in Delaware, Ohio. 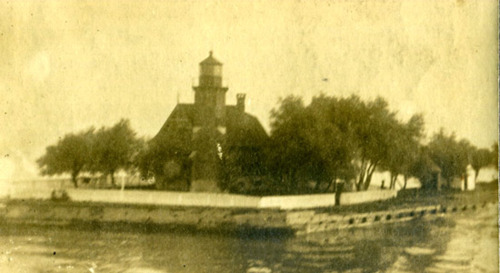 The only clues he had were that they were albumen prints and that they were probably taken in the area of the 'Great Lakes', as they were accompanied by other photographs showing a lighthouse and lots of water. Leaves were also present on the trees, indicating the late spring-summer months of May to October as the likely seasonal date. Now in any identification of old photographs, five questions have to be answered - Who, What, When, Where and How. In answering each of these questions often gives clues which help with the unanswered ones. I will begin with the easiest and leave the hardest ones until last. This is the easiest one to answer if the photograph is in your hands, thus enabling an identification of the photographic processes involved into taking the original negative and the production of the positive copy (if there is one). In the case of the two cometary photographs, we know that the albumen prints. This fact narrows down the likely date for the photographs. The albumen process was first invented in 1850 by Louis Désiré Blanquart-Evrard, and was the first commercially exploitable method of producing a photographic print on a paper base from a negative. It used the albumen found in egg whites to bind the photographic chemicals to the paper and became the dominant form of photographic positives from 1855 to the turn of the 20th century, with a peak in the 1860-90 period. The negative is traditionally a glass negative obtained with a wet or dry collodion emulsion, but this step can be performed with almost any other photographic method, including gelatino-bromide 'dry' photographic plates. From the above we can narrow the date of the photographs tbetween 1855 at the earliest to about 1910 at the very latest. You might think that the answer to this question is obvious, that is it was taken by an astronomer. In fact it was almost certainly not the work of an astronomer, but a very good and experienced photographer. 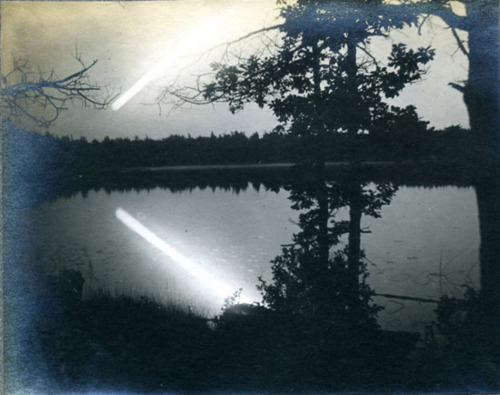 The fact that, great has been taken in 'framing' the shots and especially the reflection of the comet on the water in the two photographs, is undoubtedly the work of either a 'jobbing' photographer or an amateur with a 'good eye'. An astronomer on the other hand always takes his cometary photographs at night against a starry background, not at twilight when these were probably taken. The location of the photographs is almost certainly somewhere in the 'Great Lakes' area of North America. They are a collection of freshwater lakes located in northeastern North America, on the Canada–United States border which connect to the Atlantic Ocean through the Saint Lawrence Seaway and the Great Lakes Waterway. The five lakes - Superior, Michigan, Huron, Erie, and Ontario, form the largest group of freshwater lakes on the Earth and contain 21% of the world's surface fresh water. A feature of the lakes is the presence of a number of impressive lighthouses, one of which was included in the scrap book. This is a relatively easy question to answer in this case. The two photographs are of a 'Great Comet', by that is meant one that is visible in daylight. A diffuse cometary image becomes noticeable to the naked eye when it reaches a magnitude of approximately 3.4 in a dark sky. Compared to a comet whose magnitude is 4, a 3rd magnitude comet would appear 2.5 times brighter and a magnitude 2 comet would appear 2.5 x 2.5 = 6.25 times brighter still, etc. The brightest star in the sky (Sirius) has an apparent magnitude of about -1.4. At its brightest, the planet Jupiter appears at magnitude -2.7 and Venus at -4.4. This fact narrows the number of possible comets down considerably. So which of the nine possibles is our mystery comet? The firm favourite has to be Comet 1882 R1 for a number of reasons. It is the only one which is bright enough to be able to produce a reflection on water in twilight. It was at its closest approach in the middle of September and therefore a 'summer' comet. 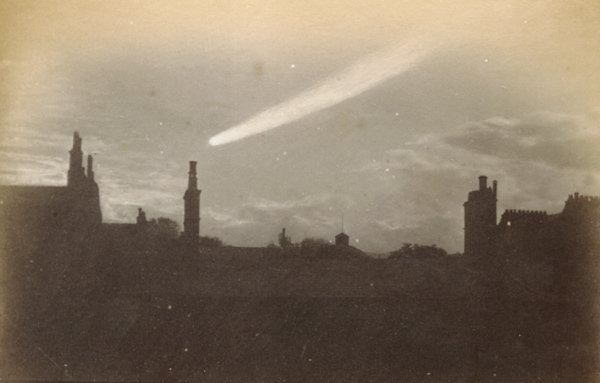 Also the tail was straight and long as shown by a photograph of the comet taken at about the same time (see below). All the other candidath are either two faint, or reached perihelion in winter or had tails which were curved or in the case of 1861 J1 multiple. So the likely mystery comet is therefore 1882 K1. QED! Our comet photographs if they are of 1882 K1 then they are not only probably the two finest early images of a comet, but are alo extremely rare. It is known that apart from the photograph depicted below, only David Gill, Her Majesty's astronomer at the Cape captured this comet on a photographic plate. On the 7th of January 1839, members of the French Academie des Sciences were shown by Francois Arago products of an invention that would forever change the study of astronomy - photography. The astonishingly precise pictures they saw were the work of Louis Jacques Mandé Daguerre, a Romantic painter and printmaker most famous until then as the proprietor of the Diorama, a popular Parisian spectacle featuring theatrical painting and lighting effects. Each Daguerreotype (as Daguerre dubbed his invention) was a one of a kind image on a highly polished, silver-plated sheet of copper. It was the Polaroid of the day. Even Arago, the then director of the Observatoire de Paris, was reportedly surprised by a daguerreotype image of the moon (which has not survived). Neither Daguerre's microscopic nor his telescopic Daguerreotypes survive, for on the 8th of March 1839, the Diorama—and with it Daguerre's laboratory—burned to the ground, destroying the inventor's written records and the bulk of his early experimental works. In fact, fewer than twenty-five securely attributed photographs by Daguerre survive—a mere handful of still life, Parisian views, and portraits from the dawn of photography. On the 23rd of March 1840, after a number of unsuccessful attempts, the New York Professor of Chemistry, John William Draper (1811-1882) reported, at a meeting of the New York Lyceum of Natural History, later to become the New York Academy of Sciences, that he had been successful in utilizing a 6-inch (13cm) Reflector Telescope and a small Daguerreotype camera to photograph the Moon’s surface on one inch diameter plates with a twenty minute exposure. 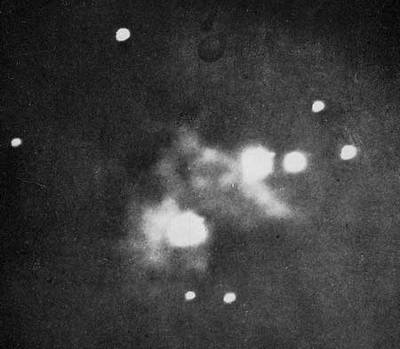 This was the first successful photograph ever taken of an astronomical object. According to Francois Arago, a number of 'large scale' Daguerreotypes of the Sun were obtained by Armand Hippolyte Louis Fizeau (1819-1896) and Jean Bernard Léon Foucault (1819-1868) at the Paris Observatory. One of these photographs, taken on the 2nd of April 1845, still survives. 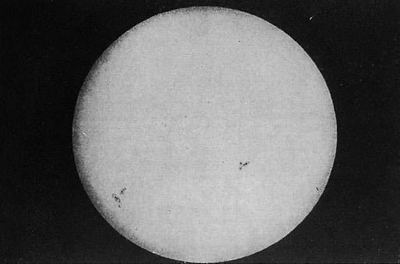 This is the earliest surviving 'large scale' photograph ever taken of the Sun showing its spots as well. An earlier 'coin' sized photograph of the Sun by Fizeau and Foucault exists. 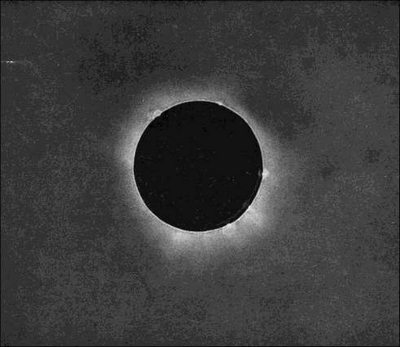 A Daguerreotype photograph of a total eclipse of the Sun which took place on the 28th of July 1851 Konigsberg, Prussia (now Kaliningrad, Russia) was obtained by a Mr. Berkowski, recording the inner corona and several prominences. This is the first successful photograph ever taken of a Total Eclipse of the Sun. In 1857 George Philips Bond (1825-1865) and the Boston photographer , John Adams Whipple (1824-1891) and his partner, James Wallace Black (1825-1896), produced wet collodion photographs of the double star Mizar (zeta Ursa Majoris) and its fourth magnitude companion Alcor (80 Ursa Majoris) using the 15-inch (38 cm) ‘Great Harvard’ Refractor. This was the first successful attempt at photographing a double star and more importantly its fainter companion. On the 30th of September 1880 the New York Doctor, Henry Draper (1837-1882), the son of John William Draper, photographed the 'Great Orion' nebula (M42) using his 11-inch Alvan Clark Refractor with an exposure of 51 minutes, from his Observatory at Hastings-on-Hudson, New York. This was the very first photograph ever taken of a Deep Space Object (DSO). In March 1881 he took an even better photograph of M42 with an exposure of 104 minutes, and a year later in March 1882 he produced a third photograph, extending the exposure of M42 to 137 minutes. 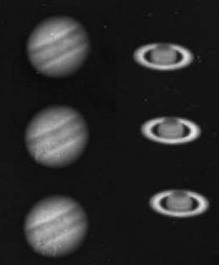 In the years 1885-86 the French astronomer brothers, Paul Henry (1848-1905) and Prosper Henry (1849-1903) took a series of photographs of the planets, when they imaged Jupiter and Saturn. 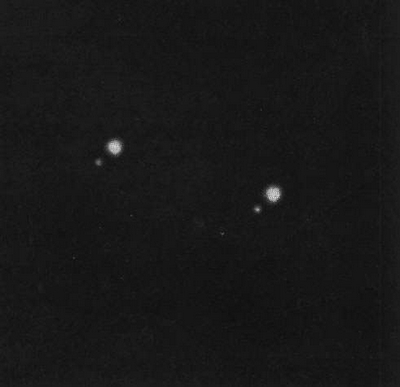 These photographs were the first successful images ever taken of a planet. Prior to this time others had tried including contemporary pioneers like Warren de La Rue, but failed; his images of 1857 were only ½ mm across, and were therefore barely visible! In 1888 Williamina Fleming was to make a discovery which Astrophotographers all around the world will thank her for (and curse her just as much!). The dark nebula Barnard 33 was first noticed that year by her on photographic plate No. 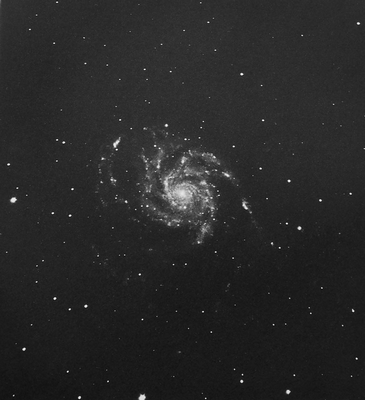 B2312; taken at the Harvard College Observatory by William Henry Pickering. 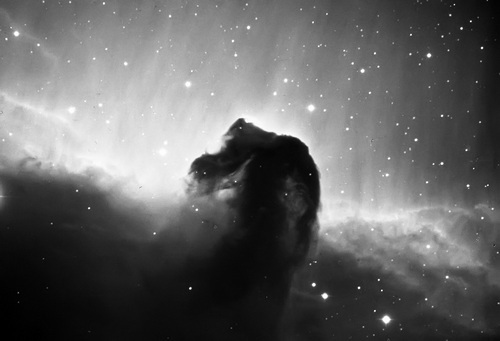 It was afterwards to become universally known as the ‘Horsehead’ Nebula. 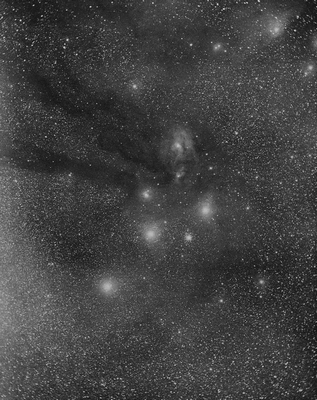 Plate 2312 was taken with 90 minute exposure using the Harvard Observatory's 8-inch Bache Telescope. The plate covered an area of sky about 10 degrees square, of which the inner 7 degrees provides good definition. This was the first ever photograph taken of the most iconic all astronomical objects – the famous ‘Horsehead’ Nebula in Orion. 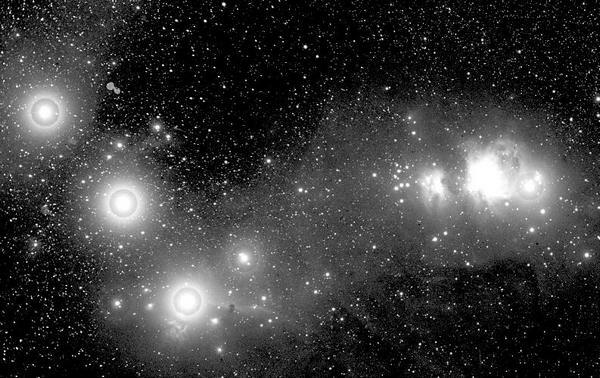 During the period 1892 to 1895 Edward Emerson Barnard (1857-1923) began taking a series of wide field images using the 6-inch Crocker Astrograph at Lick Observatory, Mount Hamilton California. These included many famous clusters, galaxies and nebulae including, the ‘Pleiades’ open cluster (M45), the ‘Great Orion’ nebula (M42), the ‘Lagoon’ nebula (M8), the ‘Great Andromeda Spiral’ (M31) and the Rho Ophiuchi nebula (IC 4604). These images were the first truly wide wield images ever taken, where each inch on the photographic plate amounted to almost four ‘full moons’ across. The series of photographs taken by James Edward Keeler (1857-1900) and Charles Dillon Perrine (1867-1951) during the period 1898 to 1903 using the 36-inch 'Crossley' reflector firmly established the supremacy of large silvered mirrored reflectors over the ‘Great Refractor’ for Deep Space Astrophotography. These images included many famous Messier objects including the ‘Great Hercules Cluster’ (M13), the ‘Trifid’ nebula (M20), the ‘Great Orion’ nebula (M42) and the famous spiral Galaxy M101 in Ursa Major (featured here), as well as less well known objects such as the ‘Whale Galaxy’ NGC 4631, the ‘Iris’ nebula NGC 7023 and the ‘Running Man’ nebula (NGC 1977). 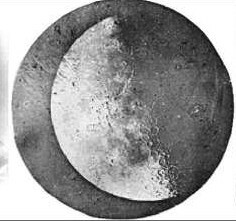 In the period 1894 to 1910, Maurice Loewy (1833-1907) and Pierre-Henri Puiseux (1855-1928) obtained 6000 photographs, over 500 nights of the Moon using the 24-inch (60 cm) Paris observatory Equatorial Coudé refractor. 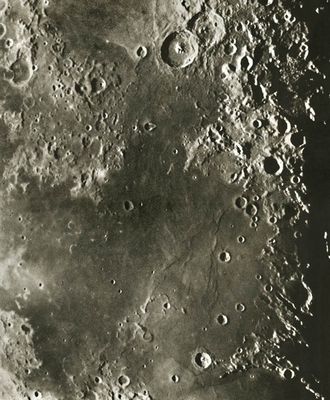 These images were used to create the first detailed atlas of the Moon - L'Atlas Photographique de la Lune, which was published by the Paris Observatory between the years 1896 to 1910. 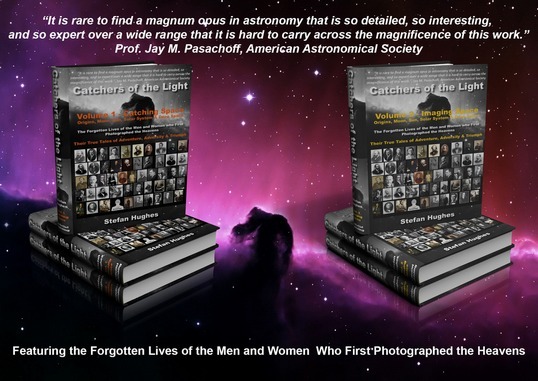 Their images remained unsurpassed in their quality for half a century or more until those taken by the Lunar Orbiters in the 1960s.